1. Preheat the oven to 200°C, gas mark 6. For the Old Bay seasoning, mix all ingredients in a bowl and set aside in an airtight container to season the triple-cooked chips. 2. Take 3 bacon slices and lay them flat, each slice slightly overlapping the next. Place these between sheets of clingfilm. Using a rolling pin, and applying little pressure, roll the bacon out lengthways, making a ‘sheet of bacon’. Remove the top layer of clingfilm, and place your beef burger at one end. Roll the burger up in the bacon (the ends of the bacon should slightly overlay the burger). Using the bottom sheet of clingfilm, wrap the burger in the bacon. Repeat with the remaining burger. 3. Place the bacon-wrapped burgers in the fridge for a couple of hours. 4. Cook the burgers in a frying pan, bacon seam side down first, for 2-3 minutes each side. Transfer to the oven for 5-8 minutes until cooked throughout. Preheat the grill to high, then place the burger onto a cooling rack over a tray. 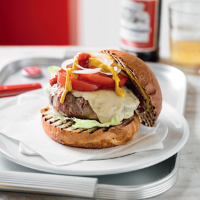 Place a slice of the Cheddar on the burger and place under the preheated grill until the cheese begins to melt. 5. Transfer the burger onto the bottom half of the brioche bun. Add a couple of slices of onions, tomato and lettuce. Finish by drizzling over some mustard and ketchup. Serve with the triple-cooked chips tossed in a little Old Bay seasoning.